If Sen. Chuck Schumer can’t agree with President Trump on the Iran deal, what can he agree on? That’s the question after the senator’s bizarre flip-flop on the Obama administration’s appeasement of the ayatollahs. Schumer flipped right after Trump announced he was decertifying the nuclear pact. “We won’t allow the Iran deal to be undone,” Schumer tweeted. The Democrat tried to hide behind the defense secretary and chairman of the Joint Chiefs. “The @SenateDems agree with #SecDef Mattis and General Dunford,” Schumer tweeted. Schumer claims he wants Trump to implement other sanctions on Iran. Meantime, he wants to keep the deal Barack Obama and John Kerry struck in place. What an oleaginous oligarch. Only two years ago, Schumer — at the time, chairman of the Senate Democratic Policy Committee — broke with his partyto oppose the Iran deal. Schumer even sided with the GOP to try to get a vote against it on the floor of the Senate. At the time he had wrapped his decision in personal angst and high drama. This came to a head at an emotional meeting with Orthodox Jewish leaders. He finally put out a long statement announcing he’d vote against the deal. The senator carried on about how carefully he’d studied the matter, concluding we could be worse off in 10 years with the agreement than without. Threats against Israel were a part of his fears. In the end, though, Schumer took a powder. He failed to lead an effort to corral Democrats around to his view, the way, say, then-Senator Lyndon Johnson did on the 1957 civil-rights bill. That is, it was all about Schumer’s preserving his chances for succeeding retiring Harry Reid as leader of the Democratic minority. Once that was done, it was back to politics as usual. Which Trump nailed this week after Schumer flipped. “Dem Senator Schumer hated the Iran deal made by President Obama, but now that I am involved, he is OK with it,” Trump tweeted Monday. “Tell that to Israel, Chuck!” the president added. 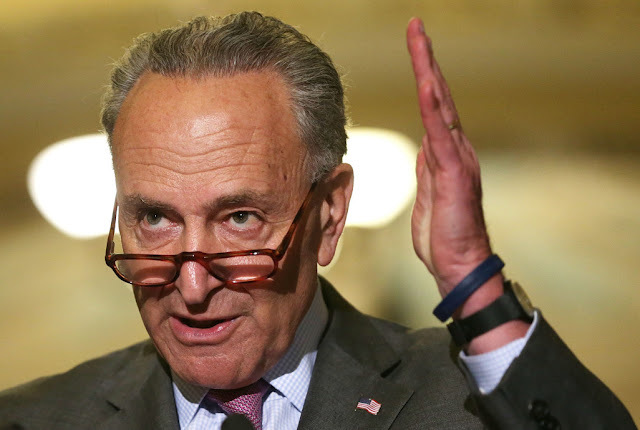 It was a reference not only to Schumer having carried on about his concern for the Iran deal’s impact on Israel. Trump was also referring to the fact Israel has opposed the Iran deal from beginning to end. And not just right-of-center Prime Minister Benjamin Netanyahu, but also the left-of-center opposition led by the Zionist Union. The Democrats’ default on the Iran deal is a marker of the fact that Israel has been slipping away from the party for years. The Jewish state is by no means the only concern raised by the Iranian nuclear program. But it’s certainly one. Hence the question: What common ground exists if Trump and Schumer, two New Yorkers, can’t agree on how to deal with the Iranian A-bomb program? And Schumer may need something to show for his own claim to leadership in the Senate. Particularly in a party that seems to be tumbling leftward as fast as you can say Sanders-Warren. It may be that none of this will be settled until next November, when Americans will choose the 116th Senate. Is Schumer going to be merely a fly on the wall in that contest, where control of the Senate could be up for grabs? Schumer, I’m told, has been sounding out support for a new organization of conservative Democrats that could be similar to the Progressive Policy Institute, which once helped boost Bill Clinton but has been eclipsed by the left. That strikes me as a smart move if the Democratic Party is to have any chance at political redemption. What’s the point, though, if Schumer can’t even cross the aisle to oppose an Iran deal he himself voted against?